Music in the air, music in the sea, music in the animals, music in the trees – the music of the spheres is there to be heard within everything upon the Earth. The sound of the bird song, the sparkling of the spring and the whistling of the wind all contribute to the song that nature constantly sings. By spending time in nature, we can feel rejuvenated as our stresses and tensions melt away with the sights, scents and sounds. We can breathe in the fresh air and allow ourselves to be serenaded by the birds and wind in the leaves. Nature has inspired musicians to create music since ancient times. 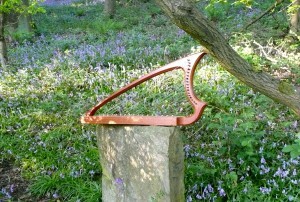 In the 6th century BC, Pythagoras used to walk in nature to the accompaniment of his lyre. In the mild climate of the Mediterranean many a music lesson took place under the cool shady protection of the olive trees. Playing music in the natural environment can encourage us to reconnect and harmonise ourselves with nature. It can help us gain a greater understanding and appreciation of our surroundings, including the rocks, rivers, trees, animals, birds and skies, which are all made from the four elements of fire, air, water and earth. By regularly engaging in this activity, we can watch as nature turns her ever-changing cycle of seasons.